The GSV is accessed either percutaneously with a special needle or surgically. Here, the GSV is accessed surgically by making a small stab wound and using the phlebectomy hook to pull out a small loop of the vein. 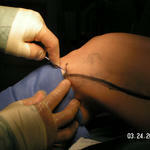 A special sheath is introduced into the vein. 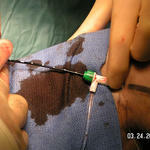 this sheath facilitates the introduction of the Closure catheter into the vein. 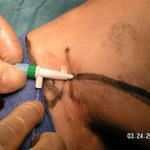 the tip of the catheter is slowly advanced to the juncture of the GSV with the deep vein under ultrasound guidance. At this point, tumeacent anesthesia has been injected all along the vein and ablation has begun by turning on the RF generator. The catheter is slowly withdrawn as the heated tip of he catheter shrinks the vein. 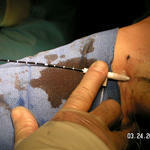 This shows the multi-prongerd tip of the catheter immediately upon completion of ablation. 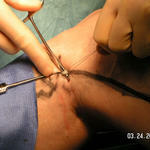 A loop of the varicose vein is grasped with the hook and then pulled out a section at a time. At completion, the small stab incisons require no stitches and will heal without scars. 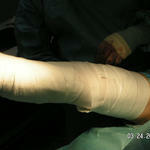 Bandages will generally stay on for three days. 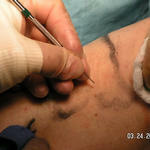 Using ultrasound as a guide the varicose veins as well as the GSV are traced on the skin with a Sharpie. This is done prior to prepping. Entry point for the Laser fiber insertion is marked. 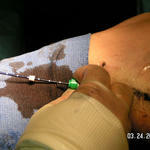 The entry to the vein can be either percutaneously with a special needle and sheath or surgically. Most cases are done percutaneously. Here, the GSV is accessed surgically. 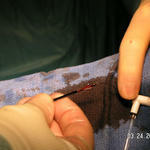 A loop of the vein is grasped and isolated with the phlebectomy hook and is ready for introduction of the Laser fiber. 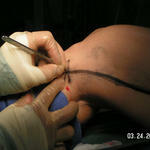 The Laser fiber is introduced into the vein and under ultrasound guidance, the tip is advanced to its juncture with the deep vein at the groin. Ablation has begun and is halfway down the thigh. Laser energy exiting the tip of the fiber is hot and this heat causes the inside walls of the vein to thicken and shrink down and occlude the vein. The red Laser light shinihg through the skin helps in localiization of the tip as it is slowly withdrawn. Incidentally, this red visble light is harmless. The therapeutic laser light is invisible and can damage the retina if exposed directly to the eye. Hence, the need for safety eyewear during the procedure. Upon completion, the tip is inspected. A small amount of char material is normal and a sign that the Laser was effective.